You don’t figure much that happens in the first three to five minutes of an NBA game is going to matter all that much or be worth repeating. It’s supposedly that last five minutes that matters. And in defeating the Boston Celtics Tuesday 100-89, the Bulls weren’t even leading in the first five minutes. They basically blew open the game to start the fourth quarter with a 16-5 run that featured three Nate Robinson three pointers and Robinson then happily skipping back on defense after the third, which gave the Bulls a 20-point lead with about six minutes remaining. I think that’s officially the first time in NBA history a player compared himself favorably to Peter Pan, the mischievous little boy who can fly and who never ages. To say nothing of seeking out happy thoughts. However, I intend to check the NBA Encyclopedia as there were some very happy guys playing in 1949, I’ve heard. Still, those first few minutes stood out. 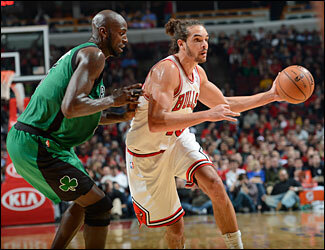 Boozer opened the scoring with a layup as Joakim Noah fired a baseball pass to Boozer diving to the basket. Then Deng sprung open at the baseline and Noah pitched over for Deng’s 15 footer. The Bulls were having their own issues, as most everybody does, controlling Rajon Rondo, who finished with 26 points and eight assists. But back to the Bulls trailing 7-4. Noah faked a handoff to Marco Belinelli, and then threw over the top as Belinelli moved past and toward the basket, the pass from Noah settling in his hands for a layup. Noah then began to dribble himself into the lane. The Celtics came, and Deng went back door down the baseline where Noah found him for a layup. I assume it’s happened before, and Wilt Chamberlain may have done it. But I can’t recall seeing a game open with the team’s center assisting on the first four baskets, and not only that but passing on the move, off ball fakes and screens. Noah is something of an iconoclast with a wardrobe that bounces between Paris fashion and resale shop rack items. But on the basketball floor he’s more an energetic whimsical savant with an unusual feel for the game. Noah finished with the second triple-double of his career with 11 points, 13 rebounds and 10 assists. He added three blocks and got a warm ovation from the sellout United Center crowd when he left the game midway through the fourth quarter. It was for the Bulls one of their more impressive victories of the season, especially coming off the season low scoring loss in Memphis Monday. And returning to face a Celtics team that had been in Chicago two days. Though that’s not always restful. So maybe a little assist to Rush Street. But the Celtics are one of the Eastern Conference teams most predicted would finish ahead of the Bulls this season. And they won the first game between the teams last month. But the Bulls went to 14-10 with the victory and the sagging Celtics back to .500. The Bulls shot 50 percent and had 28 assists on 37 baskets. They outrebounded the Celtics 43-35 after being outrebounded the last three games. They dominated inside, 48-36 as the Celtics play small with no true shotblockers. And the Bulls had a 16-8 edge in second chance points. 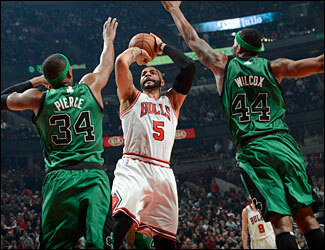 Plus, the Bulls carried the action, getting 24 free throws and making 21 for 87.5 percent. A poor free throw shooting team almost every season, the Bulls rank third in the league at more than 80 percent, which would be an alltime franchise record. So, no, you really cannot categorize this Bulls team without Rose. They are strong on defense, certainly, though it remains an ever shifting offense in which the starting point guard, Kirk Hinrich, was scoreless with two assists and the center tied a career high with 10 assists, two more than the league leader playing for the Celtics. It, of course, remains an adventure without Rose, as it was Monday in Memphis. Though Bulls players were not particularly distressed by that loss. The Bulls did that well Tuesday in a game in which one could see from the start they were so much more determined. The Bulls led 28-23 after the first quarter as Deng was going hard to the basket, accumulating eight free throws and 14 points. Deng was all over, grabbing a ball amidst a scramble late in the quarter and fouled and feasting with his slashing game as Noah’s target. It’s truly rare to find a big man with that sort of feel and confidence. Sometimes it becomes cockiness as Noah will try to complete passes in extra tight spots that result in turnovers. But it’s also Noah’s energetic play combined with that lack of fear and confidence in his feel that makes Noah unique. But Noah didn’t need much help with seven assists by halftime. The second group led by happy Nate, as we could call him this time, began to outwork the Celtics as well. They ran up a 13-point lead with Robinson hitting a pair of three (the Bulls were five of nine overall, all by Robinson) and Jimmy Butler with some more acrobatic plays at the rim. 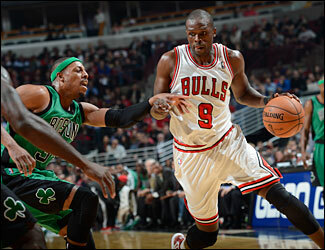 Still, the Celtics closed the half well behind Rondo’s shooting — yes, shooting — and the Bulls led 55-48 at halftime. Gibson tweaked his ankle a bit, but he said he’d be fine as he shot the ball as well as he had all season. Thibodeau even tried rookie Marquis Teague and Robinson with Robinson as the shooting guard for a bit as Boston often plays small guards. It was surprising to see Jason Terry have so little impact, though the Bulls guards played his well. It’s also unique the way the Bulls big men, particularly Noah and Gibson, can switch pick and rolls and stay with guards. It’s truly one of the secrets to the Bulls’ defensive success. Boozer and Noah do have something going the way both can pass and have become more adept at finding one another inside, though Noah has found a spot as a high post center with a keen feel. I asked Noah whom he likens himself to as a player in basketball history, and he said he always enjoyed watching and playing like Vlade Divac, one of the great passing big men. Noah also said that teaming with Brad Miller helped him develop his feel and confidence for the game. Though Noah added that the perfect interior pass isn’t quite his favorite moment. The Celtics looked like they were going to make it another of those cliffhanger games in the third quarter when they pulled within 70-67 with 3:40 left in the third quarter. Boozer had a strong slam dunk off a Noah pass earlier and Boozer scored following a Marco Belinelli miss. But the Bulls were losing Rondo, who had 13 in the quarter. And though the starting point guard margin was 26-0 in favor of Rondo, Thibodeau said he was satisfied Hinrich played the team game he required. The Bulls retained their timing at that point as Gibson scored on a jumper when Hinrich penetrated and found him and again on a Noah pass. That helped the Bulls close the third leading 79-70, and then it was Robinson opening it up with his three point shooting in the fourth and even trying a running slam dunk from the wing later. Robinson was trying about everything but throwing a waste basket of confetti into the crowd. We’re all waiting in a way as this Bulls team always seems a moment away from a surprise.